Each pack contains everything you need for a standard installation, including the Biasi ActivA system boiler, one of the most highly advanced A Rated condensing boilers on the market. The twin coil solar cylinder is of superior stainless steel construction with a high quality, insulated finish and fully itemised tapings. And the solar panel is cutting edge, with a unique enclosure to ensure an aesthetic finish. But that's not the only reason the ActivSol package is set to shine. The construction ensures minimal air movement below the collector assembly to maximize efficiency. All components are precisely sized to complement each other. And the solar controller is incredibly easy to use and install. What's more, everything is delivered directly to the installation site for complete peace of mind and convenience. 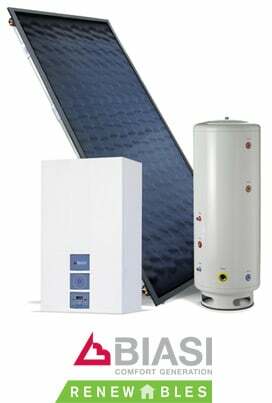 Unbelievable price on ActivSol The complete solar thermal package in Walsall (United Kingdom) company Biasi UK, Ltd..